Phone charging handbags is just the start—Everpurse is developing technology to completely infiltrate the fabric of the fashion industry. Everyone has experienced a situation in which they needed their phone but the battery had died. Whether to make a call to a loved one, find directions, or simply for a sense of security. Everpurse ® founders Liz and Dan Salcedo came up with a perfect solution for every woman, a purse that wirelessly charges your phone. The first generation Everpurse launched on Kickstarter in September 2012, met its goal by raising over $100k in its first week, and went on to more than double that over the course of the crowdfunding campaign. 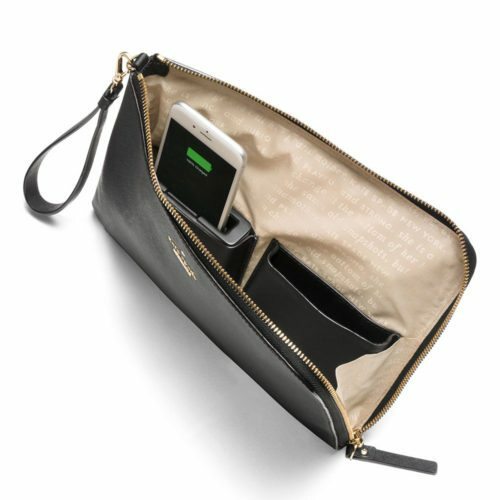 Building off the success of its Kickstarter launch, Everpurse partnered with Kate Spade and, in 2015, brought its collection of next generation phone charging purses to main street in the fashion world. Phone charging handbags is just the start—Everpurse is developing technology to completely infiltrate the fabric of the fashion industry. The future is bright for Everpurse. Today, Richards Patent Law debuts “Behind the Idea: Everpurse” the second in its ongoing series of Behind the Idea videos showcasing its clients, the stories behind their businesses and products, and their relationships with RPL. Please take a few minutes to look behind the scene at Everpurse and then head to their website to fashionably solve your charging needs.